The whooping crane rustlers are girls. Young girls. 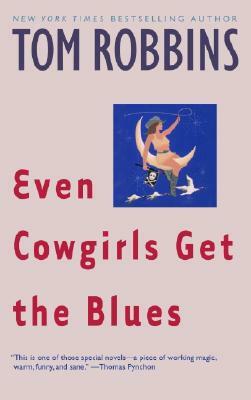 Cowgirls, as a matter of fact, all “bursting with dimples and hormones”—and the FBI has never seen anything quite like them. Yet their rebellion at the Rubber Rose Ranch is almost overshadowed by the arrival of the legendary Sissy Hankshaw, a white-trash goddess literally born to hitchhike, and the freest female of them all. Freedom, its prizes and its prices, is a major theme of Tom Robbins’s classic tale of eccentric adventure. As his robust characters attempt to turn the tables on fate, the reader is drawn along on a tragicomic joyride across the badlands of sexuality, wild rivers of language, and the frontiers of the mind. Tom Robbins has been called “a vital natural resource” by The Oregonian, “one of the wildest and most entertaining novelists in the world” by the Financial Times of London, and “the most dangerous writer in the world today” by Fernanda Pivano of Italy’s Corriere della Sera. A Southerner by birth, Robbins has lived in and around Seattle since 1962.